Yikes Scripture #2! The Gerasene Demoniac! I can’t think of a more graphic story from Jesus’ Galilean ministry than the exorcism of the Gerasene demoniac. Sometimes when I read it, I find it funny. Sometimes I find it troubling. But I never get tired of it! The story is told with particular zeal in Mark, who is known for narrating stories in a way that makes you feel like you are right there. He usually achieves this with details and dialogue that seep into your mind and make it easy to imagine the scene. In this account (Mk. 5:1-20), the details draw you into the distress of the possessed man (“he was always howling and bruising himself with stones”), the power of Jesus to expel “Legion,” the desperation of the swine as they throw themselves into the sea, and the fear that grips the local people. 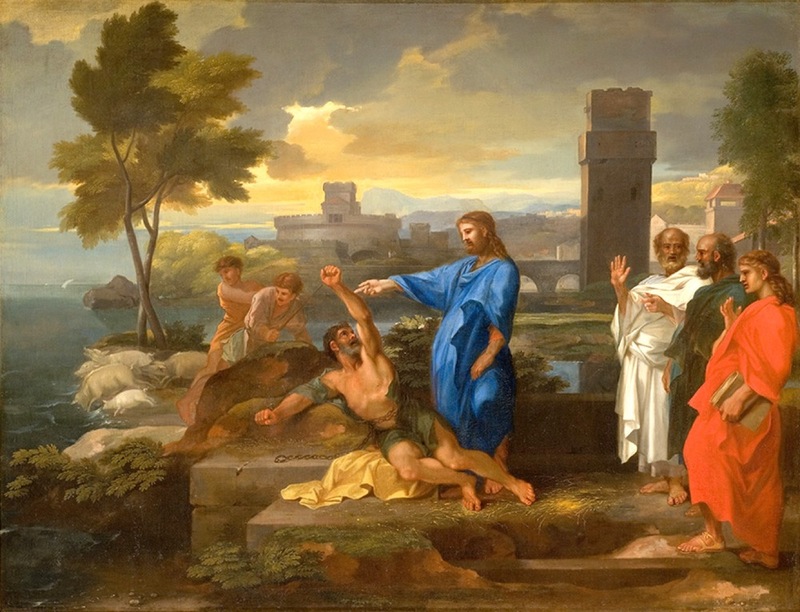 This is perhaps the most fascinating part of the story – the fact that the people of Gerasa were so disturbed by this healing that they asked Jesus to leave! As the swine hurl themselves off a cliff, you think the story can’t get any weirder. But it definitely does! The townspeople, who were once burdened with a crazy man who could not be subdued, who was so powerful that he wrenched apart chains and broke shackles into pieces, are now presented with a man “clothed and in his right mind” (Mk. 5:15)! Why in the world would you want to get rid of the person responsible for this amazing transformation? I suppose one might ask this question all the way to the Cross. There were certainly reasons that people kept trying to get rid of Jesus, until they succeeded (sort of) by crucifying him. But in this particular case, in Gerasa, think for a moment how startling, how alarming, how supernatural and unfamiliar, was this power of God on full display in the person of Jesus. Imagine standing near that cliff, hearing the demoniac unable to speak his own name (he could only speak the name of the demons), begging Jesus to send them into swine. Hear Jesus shout “Go!” (Mt. 8:32). Hear the thundering hoofs of the swine and watch the dust fly until you see them do something completely unnatural for animals to do. Watch them splash into the water and see the demoniac, now just a man, sink to the ground, exhausted, healed, relieved. Something happened on the cliffs of Gerasa that had people shaking. This was a power far beyond breaking chains and shackles, it was of another realm, it did not make sense in their world, and it frightened them. I think we can understand this. And yet there was one man who had a front row seat but did not ask Jesus to leave. Instead this man “begged him that he might be with him” (Mk. 5:18). Yes, this was the demoniac. This man was no stranger to supernatural powers. For him, there was nothing left to fear, not for his whole life.